Some facial exercise products are expensive. However, that is not true of all products of course – you can buy a book to teach you a workable routine for under 10 dollars. In fact one of my favorite anti-aging books can usually be found for around one penny on Amazon. On the other hand, MicroFacial Exercisers that work with micro-electric currents, do tend to be expensive. You can expect to pay anything between $100 and $350 for a machine designed for personal use. Of course, those built with salon owners in mind are even more pricey. hand in performing exercises without the need to spend a large amount of money. See a selection of cheap facial exercisers available on Amazon.com below. As a consummer, you might have more confidence in a facial exerciser that has been approved by the FDA. “FDA Approved” implies the manufacturer applied to the United States Food and Drug Administration for approval and recieved it. If a facial exerciser is not FDA approved, it is not to say it is inferior to FDA approved exercisers, but rather that the manufacturers have not applied for approval. Listed below are some Facial Exerciser FDA Approved for sale at Amazon. This is an interesting gadget that consists of a small metal roller which is covered in tiny needles. 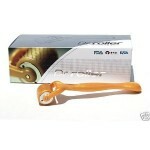 To use the gadget, you simply slide the roller over the areas of your skin you wish to treat. According to the Dr. Roller website, using a Dr. Roller device increases your skin’s ability to produce elastin and collagen. Apparently the roller gives excellent results as a treatment for wrinkles, acne scars, burn scars and can even promote hair regrowth. It certainly sounds and interesting concept, and is one of the few facial exerciser FDA approved available on Amazon. FDA Registered Galvanic Skiincare System – the EXACT same model as iLift. This model comes with 2.1oz FDA registered Palacia E.G.F.Gel.